Love is building your wife a bookcase, to the exact specifications of one she already has. It’s taking the time to make it as perfect as possible, even adding trim and adjustable shelves for a professional look. It’s trying several different finishes, searching to create the style she desires, and not complaining when she decides that she just wants it painted. It’s spending Saturday afternoon in a hot garage with pungent paint fumes so that it will be finished and ready to use. The longer I’m married, the more I’m learning that there are many ways to say “I love you.” They aren’t always verbal, nor physical, nor emotional – and rarely wrapped in a package with a bow on top. But if I listen with my heart, I can hear it….in the popping of a nail gun, the whirring of a sander. When all is said and done, it’s more than a bookcase – it’s a labor of love. Unwrap the gifts of the every day at Tuesdays Unwrapped, hosted by Chatting at the Sky. Lovely!! I can totally relate to hearing 'the popping of the nail gun' as a sign of hubby's love…I have quite the handy man on my hands too, and I'm constantly thanking him for the way he uses his special talents to bless me. Yay for your hubby and the work he went to for you…yay for you with the finished product built with love! Great post! He did a great job! So nice that he worked so hard to please you. So true! Love to me is never having to worry if there is gas in my car 😉 Your hubby did a great job! What a great way for your husband to show love! My dad does the same thing for my mom – and it's worked well for 47 years! 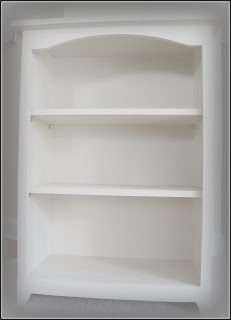 Wow–that is a *nice* set of book shelves. A labor of love, indeed. I'm thankful for the labors of love around our house – my hubby is woodworker too, so there's evidence of his love for that craft and his family everywhere. Beautiful bookshelf!! What a beauty! I'm imagining all of the wonderful books you can place on those adjustable shelves! Thanks for stopping by our blog too! Thank you (from my husband 😉 I'm very happy that woodworking is something he enjoys doing in his free time. It's productive for the family and relaxing (at least most of the time!) for him. Oh my goodness, what a beautiful book case, I am jealous! 🙂 Beautiful post! "I can only speak from my own experience, but I found the book helpful as a new mom. I didn't follow every suggestion, but generally followed a schedule and both of my babies slept through the night at an early age. I also believe that no method works perfectly for every family, but Babywise was a great starting point for a nervous new mom with no family close by." Thank you so much for this comment, and I totally agree! Every family and every baby is different, but it was a huge help just getting some ideas, and knowing more what to do and check for when the baby comes! My husband shows his love by working very long hours so that I may stay home to raise our daughter. I found your blog through the Ultimate Blog Party, and I have really enjoyed it! If you are a book lover, you might be interested in a giveaway over at my place this week! Your husband did a great job on the bookcase.